The other day I put together a cheat sheet of the shortcuts i most used in Apple Motion 5. by no means is it an extensive list of every shortcut, but I found that having a single page of the most used shortcuts helped me out. 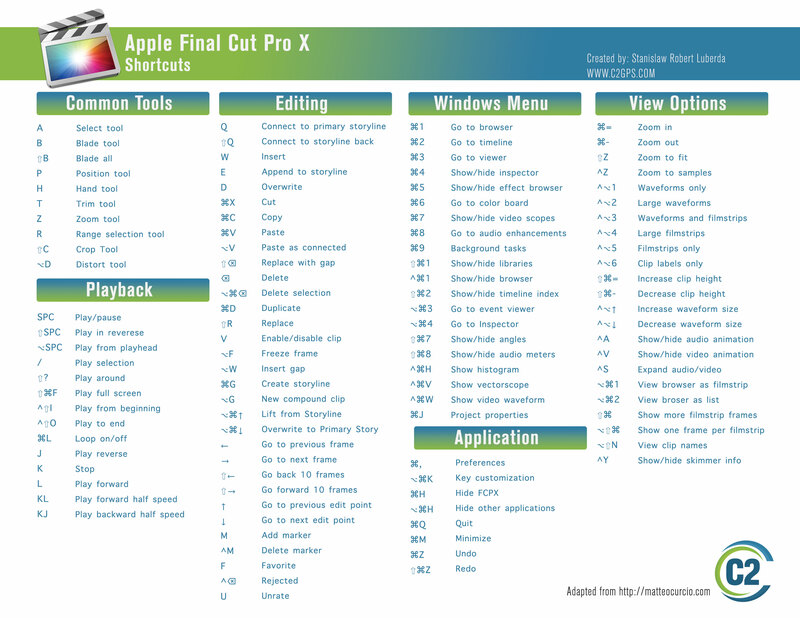 Another reason why I created it was that there were many other cheat sheets out there for other programs, but I wasn’t able to find one for Motion as easily as say Final Cut Pro X. In researching I came across some really great ones, including one from http://matteocurcio.com. They had put together a great comprehensive list of most (if not all!) of the shortcuts in Final Cut Pro X. While excellent I found it contained a lot of information that I typically don’t use too often so I adapted it to another single page. Looking to learn Final Cut Pro X? I am offering all my intro lessons for free!